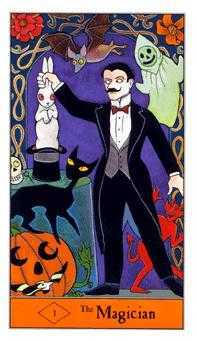 The Halloween Tarot deck started with the traditional images of the “Rider deck,” designed by A. E. Waite in 1910, and then was twisted, turned, and tweaked to create a festive, if slightly freakish, old time Halloween world. 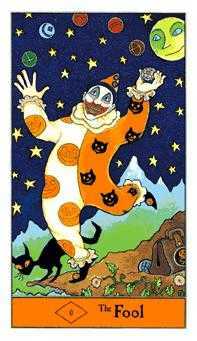 Since Halloween archetypes are fairly limited, the characters on the cards also emerged from old horror movies and circus images, and from the German-made Vegetable People that were popular Halloween toys and decorations in 1920s America. Mixed into the deck with spooky images from All Hallows’ Eve are remnants of traditional Tarot symbolism—a blend of ancient Greek, Egyptian, and Hindu mythology, Chaldean astrology, biblical references, images from the Far East and medieval Europe, and more. No one knows exactly when and where Tarot originated, but some think that Tarot cards were brought to Italy and France by Gypsies as early as the twelfth century. Tarot was a popular game by the 1400s—tarocchi in Italian, les Tarots in French—but was also used as a fortune telling tool from the time of the Middle Ages. 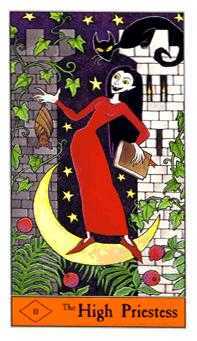 But don’t be discouraged by the abundant images and the rich history of the Tarot. Symbols by definition are supposed to make complex ideas easier to understand. Successful Tarot readings are based on what you do see, and whatever flashes of insight into your own life the pictures may offer you. 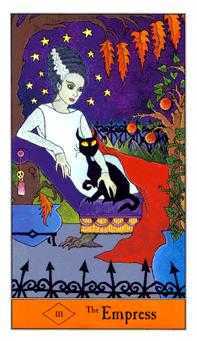 In fact, think of yourself as the black cat that appears in every card of the Halloween deck. 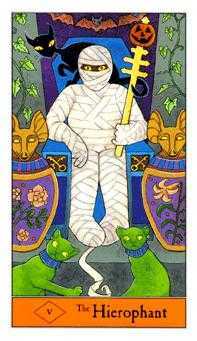 He is your touchstone, and travels through the deck with you as your companion. Sometimes he reflects the meaning of the card, but sometimes he’s just a casual observer along for the ride. 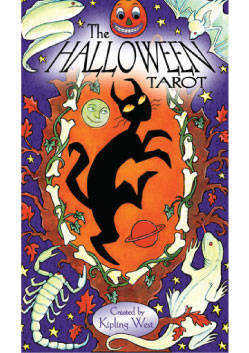 In the next section you’ll find some simple ways to get started with your Halloween Tarot deck. First, however, take out your cards and spend some time looking at them. The more familiar you become with each card and its possible meanings, the more fun and informative your readings will be. 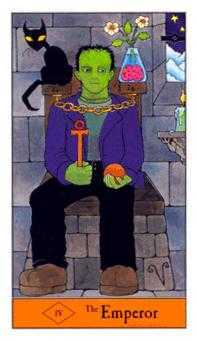 You can use your Halloween Tarot cards however you like—by yourself or with a partner, at a table or on the floor, by randomly choosing a card or laying them out in a traditional Tarot spread. Just make sure you find a quiet, peaceful room where you can step outside the squalor of life with a hot cup of tea. There is no right or wrong way to use and interpret the cards. As long as you enjoy the process and learn something new about yourself, you’re doing the right thing.